I’m a stay at home mom with four kids and every now and then I need some girl time with friends! One of my favorite things to do is throw a party and bring everyone together. Next month in light of Valentines Day, I thought it would be fun to get all the girls together for a Galentine’s Party. I’m excited and wanted to help you throw your own! Here are a few tips and tricks I’ve learned to help make throwing a party a success. Its FREE - they have lots of designs or you can upload your own design. You can download ours that we used for our party! Feel free to leave it as it is or use photoshop to add details to it. There is a comments section. People can comment their excitement, what they want to bring or why they can’t make it. You can send reminder e-mails or update any info by sending one e-mail. Decorations always seem daunting when you search Pinterest. I often get overwhelmed. But I’ve found it seems easier if I focus on 2 or 3 ideas and then use flowers as a filler. I love flowers from Trader Joes and will use some greenery for my balloon arch and to put on the food table. If you are an avid DIYer - I found this tutorial on Pinterest. They even have links to the items they purchased which is a huge help. Along with flowers, I am making this DIY XOXO table cloth! They suggested buying white fabric, but I found a white table cloth on AMAZON that will work great. I have some black craft paint and a paint brush. This pinterest tutorial is my inspiration. These XOXO balloons will be a nice touch to my balloon arch as well. Photodrop – there are lots of ideas on Pinterest for a DIY, budget friendly backdrop. I’ve learned playing a game or two really makes a party. It helps people mix and makes a fun atmosphere. FAVORITE THINGS GIFT EXCHANGE: This is my favorite part of the party! I have found many great products from my friends while attending Favorite Things parties. 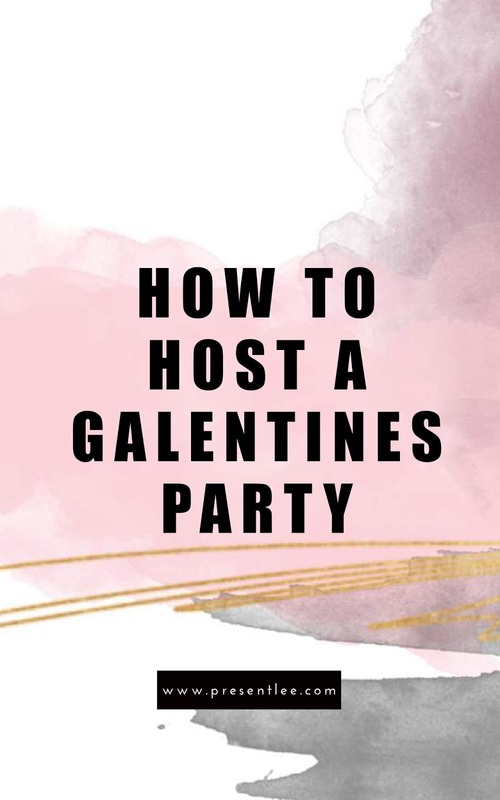 I am combining this Galentine’s party with the idea behind a Favorite Things party. I will have my guests bring their favorite items worth $20. Everyone will leave with another guests favorite thing. If you’re looking for gift ideas, check out this post. Ways to hand out gifts: In the past I’ve had everyone put their name on a piece of paper in a bag. Then we’ve gone around the circle and whatever name you drew out, that’s who gift you kept. It makes the exchange fair - so people aren’t pining over popular gifts. It’s a great way to keep everyone happy. I love this method, but I decided to step it up a notch for this year. I will be gathering as many large paper bags from grocery stores as I have people coming. Each guest will set their gift they brought in each individual bag. We will set them up at the end of the hall and do a ping pong bounce toss. Whichever bag your ping pong ball ends up in after one bounce, that is the gift you will take home. I’m doing this for one reason: It’s a great way to mix friends! I’ve learned whenever I mix friends who aren’t super comfortable with each other yet, the more interactive games you can have the better. KAHOOT: Have you ever heard of KAHOOT? It’s a trivia game on the computer or phones that you make. You create all the questions and answers and then each guest will open up the website and enter a pin designated to your game. You start the game and the players have a certain amount of time (that you decide when creating the game) to guess the answers by clicking on colored squares. The game keeps track of who answers the fastest and has the correct answers. You could give prizes for who won the top 3 or just the winner. GALEN-GORIES: We will also be playing a game called Galen-gories. You can download it here. It is similar to Scattergories. You will be given a sheet of paper with 10 questions on it. Next to each question are lines. Above each line is a letter. Your host will set a timer and you will answer the questions going down the first line. In this game the first letter is P. You will write down an answer for each question with something that starts with the letter that is above that set of lines. At the end you will go over the answers. If anyone else has your same answer - you will cross off that word. You can’t use the same word twice. Play 4 rounds with the different letters. The one with the most unique answers at the end wins. You can gift them a prize or just give them bragging rights. CANDY BAR GAME: Buy as many candy bars as you have guests. Set the candy bars in the center. Everyone will sit in a circle (or stay in their seats) and will roll two dice. Set the timer for 5 minutes. Each player will roll the dice on their turn. If they get doubles they can choose a candy bar and set it in front of them. Keep the dice moving fast around the circle. The next player to get doubles can either steal the candy bar from another guest or grab a new one. You have potential to get multiple candy bars. When the timer goes off, you keep whatever candy bars you have accumulated. If you didn’t want to use candy, you could always grab your favorite items to give out as a hostess gift or you could use dollars or any other food item. As a host in the past I’ve always felt I needed to provide all the food. This can be daunting, stressful and expensive. Now I usually ask guests to bring food and I usually concentrate on drinks. In my evite I will have ask guests to bring either an appetizer, dessert, or soda. I always provide ice, torani syrups (for a drink bar) and a big jug of water. I will provide plates, cups, utensils, straws, etc.